In acetone-butanol-ethanol (ABE) fermentation by Clostridium acetobutylicum ATCC 824 using corn-based substrate, the solvents are generally produced at a ratio of 3:6:1 (A:B:E, w/w). A higher butanol/acetone ratio of 2.9:1 was found when cassava was used as the substrate of an in-situ extractive fermentation by C. acetobutylicum. This ratio had a 64% increment compared to that on corn-based substrate. The metabolic flux and (key enzymes) genes transcriptional analysis indicated that weakened metabolic fluxes in organic acids (especially butyrate) formation and re-assimilation pathways, which associated with lower buk and ctfAB transcriptional levels, contributed to higher butanol and lower acetone production rate in fermentations on cassava. Moreover, NADH generation was enhanced under the enriched reductive environment of using cassava-based substrate, which converted more carbon flux to butanol synthesis pathway, also leading to a higher ratio of butanol/acetone. To further increase butanol/acetone ratio, tiny amount of electron carrier, neutral red was supplemented into cassava-based substrate at 60 h when butonal production rate reached maximal level. However, neutral red addition enhanced NADH production, followed with strengthening the metabolic fluxes of organic acids formation/re-assimilation pathways, resulted in unchanged in butanol/acetone ratio. A further increase in butanol/acetone ratio could be realized when NADH regeneration was enhanced and the metabolic fluxes in organic acids formation/reutilization routes were controlled at suitably low levels simultaneously. Clostridium acetobutylicum, a Gram-positive, spore-forming, and obligate anaerobe, has the ability to produce solvents with renewable biomasses including acetone, butanol, and ethanol . In acetone-butanol-ethanol (ABE) fermentation by C. acetobutylicum using corn-based substrate, the solvents are generally produced at a ratio of 3:6:1 (A/B/E, w/w). Among these solvents, butanol has the most attraction since it has been considered as a high-performance biofuel, as well as an important platform chemical. However, high substrate (such as corn) price and too much purification cost due to very low solvent concentrations are the two major factors impacting on economics of butanol production . A cost sheet from an ABE fermentation plant using corn indicated that the substrate price accounted for up to 79% of the overall production cost, while energy cost consumed in product distillation almost contributed the rest 14% of the entire cost . Therefore, seeking cheaper feedstock and increasing butanol ratio in total solvents have become the major challenges for the economic viability of ABE fermentation. Some low-priced agriculture residues for example corn fiber and wheat bran have been used in ABE fermentation by clostridia, but butanol concentration and productivity in these fermentations are much lower than those in corn-based fermentation -. Cassava, a non-grain and high starch content crop, is recognized as an economical and practical substrate for industrial fermentation. In some previous studies, cassava was successfully used instead of corn as substrate in ABE fermentation by C. acetobutylicum, and higher butanol/acetone ratios were observed when fermenting on cassava as compared with the same procedures using corn ,. In these cases, the online monitored parameters (pH, ORP, H2/CO2 ratio, etc.) and organic acid formation/reassimilation patterns were quite different from those on corn-based substrate. But the mechanism of higher butanol ratios in cassava-based fermentation has still not been illustrated clearly, for the activities of key enzymes in vivo were difficult or impossible to be measured, caused by hardly separating cells from mixed solid residues of substrate. Some efforts have investigated the special features presented in ABE fermentation by C. acetobutylicum, using either metabolic flux analysis or transcriptional analysis -. Metabolic flux analysis is a systematic approach developed to evaluate each individual reaction rate within a metabolic network. Investigation on genetic transcriptional levels directly correlates the activities of relevant enzymes. To solve the problems mentioned above, the methods of metabolic flux analysis was combined with genes (key enzymes) transcriptional measurements to explore the mechanism of higher butanol/acetone ratio feature in cassava-based fermentation. Traditional batch process is still the most commonly used operation mode in industrial ABE fermentations. However, it is suffered with severe butanol end-inhibition leading to a short fermentation period, so that interpreting many attractive phenomena becomes difficult. By contrast, in-situ extractive fermentation could relieve butanol inhibitory effect to improve fermentation productivity and to prolong fermentation time -. The in-situ extractive fermentation technique is not widely used in industrial ABE fermentation because of the high extractant cost and operation complexity. However, it could be used as an important prototype for investigating various characteristics of ABE fermentation, and guiding the optimal operation ways of ABE traditional fermentation. Among various in-situ fermentation extractants for butanol, oleyl alcohol has been recognized as the best one because of its non-toxicity to cell growth and high butanol extraction coefficient . In this study, ABE extractive fermentations by C. acetobutylicum ATCC 824 were conducted in a 7-L anaerobic fermentator, under the conditions of using different biomass substrate (corn or cassava). Combinational analysis of metabolic flux distribution and gene transcriptional levels were carried out to find out the variations in intracellular carbon distributions and transcriptional levels when using corn- or cassava-based substrate. All these efforts aimed to clarify the mechanism of higher butanol/acetone ratio obtained when using cassava-based medium and explore the optimal operation way for traditional ABE fermentation characterized with high butanol/acetone ratio. C. acetobutylicum ATCC 824 was used in this study. The strain was maintained as spore suspension in 5% corn meal medium at 4°C. The methods of inoculation and pre-culture followed those described in the literatures ,. The corn flour (raw starch content about 50% w/w) was obtained at local market and cassava powder (raw starch content about 65% to 70% w/w) was provided by Henan Tianguan Fuel Ethanol Co. Ltd., Nanyang, China. The media were pretreated by adding certain amount of α-amylase (8 U/g-corn or cassava, heated in boiling water bath for 45 min) and then glucoamylase (120 U/g-corn or cassava, heated at 62°C for 60 min). Subsequently, the viscosity-reduced media were autoclaved at 121°C for 20 min. Oleyl alcohol (Tokyo Kasei Co. Ltd., Tokyo, Japan) was used as the extractant for in-situ extractive fermentation. Oleyl alcohol was either sterilized at 121°C for 20 min or directly used without sterilization, and then added into the fermentor. When using cassava as substrate, the concentrated yeast extract solution was sterilized at 115°C for 30 min, and then pumped into the broth upon requirement since it has been revealed in the previous study that yeast extract could promote the phase shift in ABE fermentation with cassava substrate . Neutral red was dissolved in sterilized water and pumped into the broth at 60 h.
Seed culture was carried out in 100-mL anaerobic fermentation bottles using corn as the substrate. The initial corn or cassava meal content for extractive fermentations was 30% or 25% (w/v). The fermentations were conducted in a 7-L static fermentor (Baoxing Bioengineering Co., Shanghai, China) equipped with pH and ORP (oxidative-reductive potential) electrodes and a manual adjusted pressure unit. A temperature-controllable water bath (MP-10, Shanghai Permanent Science and Technology, Co., Shanghai, China) was used to circulate hot water into the coil pipes settled inside the fermentor to maintain broth temperature at 37°C. The fermentation medium loading volume ranged from 1.8 to 2.5 L, and equivalent volume of oleyl alcohol was added to ensure a 1:1 oil/broth volumetric ratio. N2 was sparged into the extractant reservoir for 10 min to remove residual oxygen. 10% (v/v) inoculum was transferred into the fermentor and then N2 was also sparged into broth for 10 min. The oxygen-free oleyl alcohol was poured into the fermentor using a peristaltic pump after inoculation. The initial pressure inside the fermentor was controlled at about 0.02 MPa (N2) to strictly maintain the anaerobic condition. The pressure gradually increased since fermentation started and self-generated gas began to evolve. The pressure was then controlled in a range of 0.030 to 0.055 MPa throughout fermentation. Agitation was occasionally adopted for a short time (5 min, 400 rpm) to promote butanol diffusion from aqueous phase into extractant phase. The measurements of concentrations of solvents, organic acids and reducing sugar (glucose) were the same as those described in our previous reports ,. On account of the volume ratio of aqueous to organic phase being just 1:1 in extractive fermentation, the total concentration of butanol (or acetone) was the sum of butanol (or acetone) in broth and in extractant. H2/CO2 ratio in exhaust gas was determined using the same method reported in our previous work . The concentration of important intermediate, butyraldehyde in broth was determined by a gas chromatography (Shimadzu GC-2010, Kyoto, Japan) with flame ionization detector and DB-23 capillary column (60 m × 0.25 mm ID × 0.32 μm, Agilent, Sta. Clara, CA, USA). The condition was described as follows: nitrogen was used as the carrier gas at a velocity of 1.2 mL/min; the hydrogen and air flow rates were 47 and 400 mL/min, respectively; injector temperature was operated at 200°C, and detector temperature at 250°C; the initial temperature stayed at 40°C for 5 min, and then raised at the velocity of 10°C per min until arriving to 180°C, and finally stayed for another 5 min. Metabolic flux analysis involves the calculation (or estimation) of in vivo fluxes from substrate and product data, by using a system of linear equations developed from reaction stoichiometry . 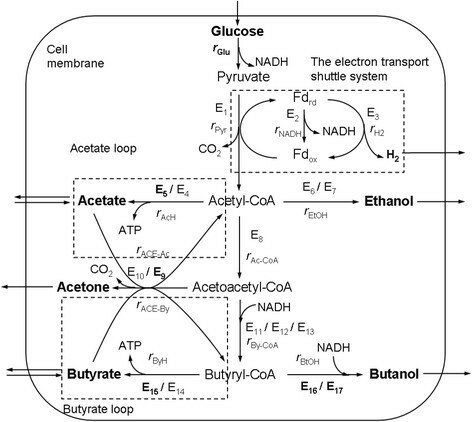 For the purpose of metabolic flux distribution analysis, a simplified metabolic reaction model (MR) was developed for butanol synthesis by C. acetobutylicum ATCC 824. This simplified model (Figure 1) covered the basic reactions and occurred in the glycolysis pathway, organic acids formation/reutilization routes, solvent synthesis branches, and the electron transport shuttle system. Cell growth and ATP synthesis were not included in the model, since the metabolic flux distribution analysis was conducted in the solventogenic phase where cell growth almost ceased and ATP demand was less . The basic metabolic pathway of acetone and butanol biosynthesis by Clostridium acetobutylicum ATCC824. As shown in Figure 1 and the Appendix, the MR model contained 19 metabolic reaction rates (k = 19). Among the rates, seven extracellular substance rates were measurable (m = 7) including rates of glucose consumption, organic acid formation or re-assimilation, solvents synthesis, and hydrogen evolution. As shown in the Appendix, there were a total of 13 substances (n = 13) covering substrates, products and intermediate metabolites, and thus 13 mass balance equations were available. Thus, this MR model is an overdetermined system (n = 13 > k-m = 12). All of the unknown reaction rates could be optimally determined using the measurable rate data and the stoichiometric coefficients of the metabolic reaction matrix with the aid of the calculation package embedded in Matlab (Ver. R2010b, MathWorks Inc., Natick, MA, USA) . The following treatments were applied in the network model calculation: (1) glucose was calculated in the model as single carbon resource since it was the most preferred for strain and highest percentage in these complex mediums; (2) glucose consumption rates were normalized as 100 mmol/(L⋅h), and the other measurable rates were recalculated using the above (glucose) normalization coefficient; (3) pseudo-steady state assumption was adopted for intracellular intermediate metabolites. Total bacterial RNA was extracted using Trizol Plus RNA Purification Kit (Invitrogen™, Life Technologies Corp., Grand Island, NY, USA). Before starting RNA extraction, all the samples were percolated through filter paper to remove cassava/corn residues. 1 mL Trizol® Reagent was added to wet cell for lysing cell and disassociating protein from nucleic acid. Then, 0.2 mL of chloroform was supplied into the homogenate liquid following with a vigorous shaking, in order to extract the protein out of aqueous phase. After transferring the aqueous phase to a new tube, 100% isopropanol (0.5 mL) was added to separate RNA out of the aqueous phase. It must be noted that using the appropriate precautions to avoid RNase contamination when preparing and handling RNA. Total RNA was used as the template to synthesize cDNA, and then cDNA products were amplified by the method of real-time fluorescence quantitative PCR with the primers listed in Table 1. The following PCR conditions were adopted: an initial denaturation step at 95°C for 10 min, followed by an amplification and quantification program repeating for 40 cycles (95°C for 10 s, 60°C for 60 s with a single fluorescence measurement), and a melting curve program (a continuous fluorescence measurement raising temperature from 60°C to 95°C with a slow heating unit). Figure 2 shows the extractive fermentation performances (with oleyl alcohol as extractant) when using either corn or cassava as substrate. The change patterns of pH and total gas production yields no significant distinction (Figure 2a). However, ORP and H2/CO2 ratio for the two cases (Figure 2b) are quite different. 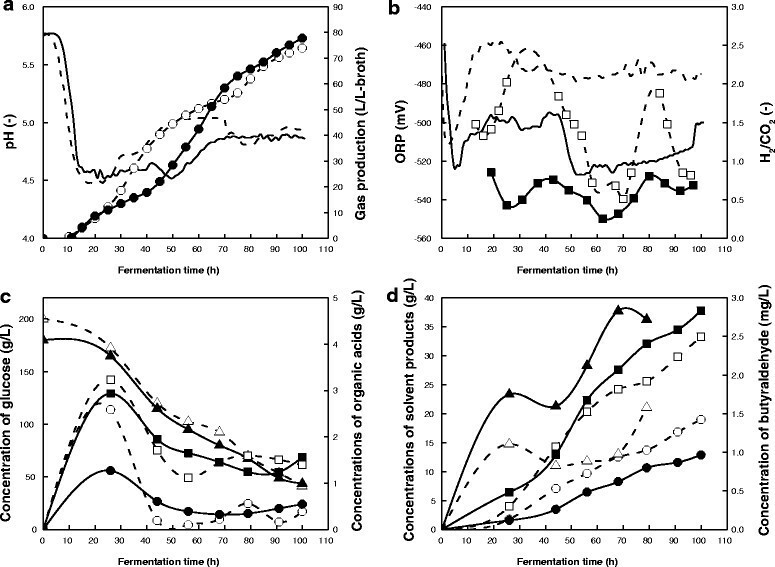 ORP in cassava-based broth reached −520 mV in the solventogenic phase of fermentation, which was visibly lower than that of corn-based broth (−470 mV). H2/CO2 ratio stayed at a low level of 0.2 to 0.7 when culturing with cassava-based substrate, while fluctuating in the range of 0.6 to 2.5 in corn-based fermentation. 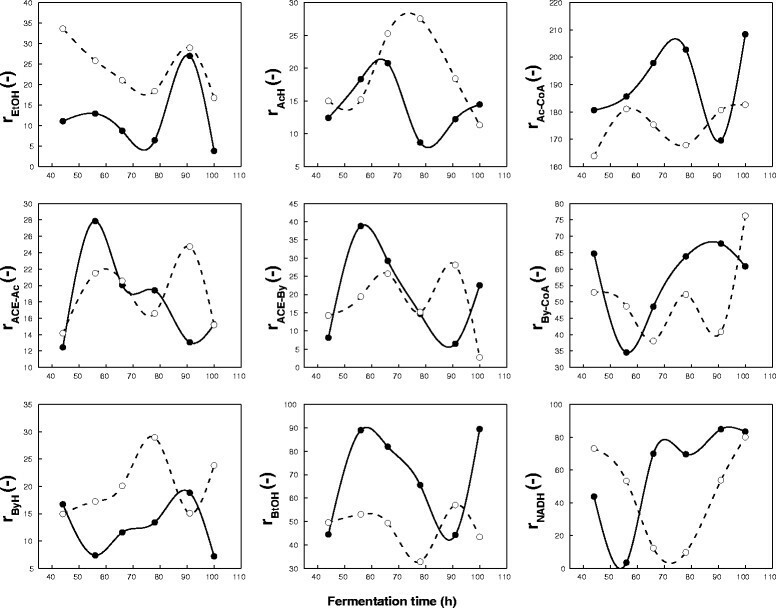 Performance comparisons of butanol fermentations using corn- (open symbols and broken lines) and cassava-based substrates (filled symbols and solid lines). (a) pH (line) and gas production (circle). (b) ORP (line) and H2/CO2 ratio (square). (c) Acetate (square), butyrate (circle), and glucose concentrations (triangle). (d) Total butanol concentration (square), total acetone concentration (circle), and butyraldehyde concentration in broth (triangle). The maximum butyrate accumulation in cassava broth was 1.2 g/L, only half of which in corn broth. Furthermore, after entering solventogenic phase, acetate and butyrate re-assimilation rates were significantly slower in cassava-based fermentation. The final solvent concentrations (including butanol and acetone in both extractive and aqueous phase. ethanol was not accounted for due to low accumulation) reached a total level of 50 g/L in both cases, in which butanol/acetone ratio was 2.87 using cassava-based substrate and 1.75 with corn. All these distinctions, particularly butanol/acetone and H2/CO2 ratios, were important in understanding the optimal regulation for ABE fermentation. Their mechanisms should be properly interpreted. High butanol/acetone ratio is desirable for ABE fermentation. It reached nearly 2.9 when using cassava-based substrate, a 64% enhancement compared to corn. To understand this result, metabolic flux analysis was conducted to explore the mechanisms. As shown in Figure 1, the metabolic fluxes of butanol production by C. actobutylicum ATCC 824 mainly includes the metabolic reaction rates of rAc-CoA and rBy-CoA in central butanol synthesis route after acetyl-CoA node, rAcH and rByH in acetate/butyrate formation routes, rACE-Ac and rACE-By in acetone synthesis branch, rBtOH in butanol production branch, rEtOH in ethanol formation branch and rNADH (NADH generation rate) in the electron transport shuttle system. The metabolic fluxes during the solventogenic phase (40 to 100 h) are depicted in Figure 3. As shown in the figure, when fermenting on corn-based substrate, acetate and ethanol formation fluxes (rAcH and rEtOH) are much higher than those on cassava-based substrate throughout the solventogenic phase, resulting in a less carbon flux in the central butanol routes (rAc-CoA). Moreover, butyrate formation flux of rByH when fermenting corn-based substrate is also significantly higher. The butyrate formation (rByH) flux is inversely associated with the flux in butanol production branch (rBtOH) because they compete for carbon resource at butyryl-CoA node. Therefore, a higher rByH (in the case of fermenting corn-based substrate) led to a lower flux in butanol synthesis branch (rBtOH). Since acetone formation branch flux is the sum of rACE-Ac and rACE-By (shown in the Appendix), when fermenting cassava-based substrate, both rACE-Ac and rACE-By declined sharply after 55 h, resulting in a lower acetone synthesis flux. In addition, the reductive power NADH, an extremely important cofactor in butanol synthesis, also may have contribution to the extent of butanol/acetone ratio. NADH is mainly produced from two pathways, the glycolysis and the electron transport shuttle system. 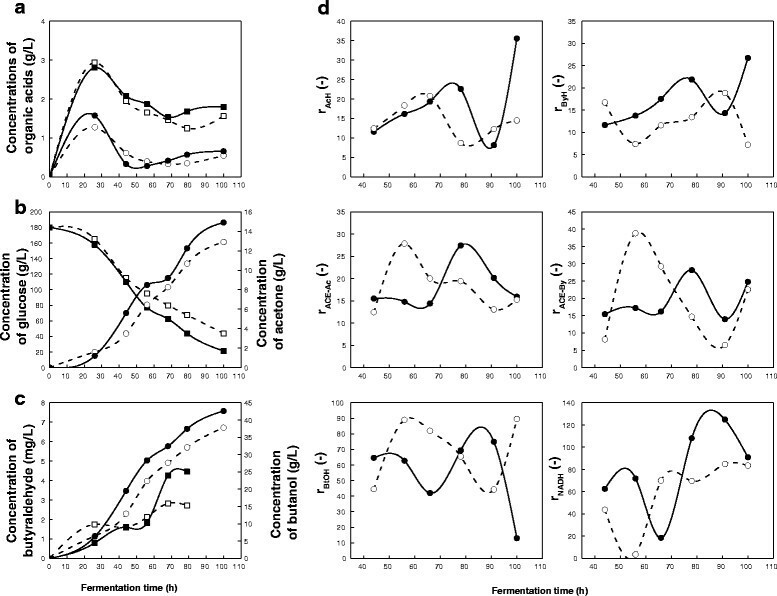 In this study, the glucose consumption amount and rate using two different substrates had nearly the same change patterns (shown in Figure 2c), which meant that the NADH produced from the glycolysis were equivalent between fermentations on corn and cassava. However, the NADH generated from the electron transport shuttle system had visibly different production rates in two cases. As shown in Figure 3, rNADH stays at high levels during most period of the solventogenic phase when using cassava-based substrate. Correspondently, fluxes in the NADH-dependent pathways of butyryl-CoA and butanol formations (rBy-CoA and rBtOH) are largely enhanced in the case of fermenting cassava. In order to verify the NADH balance, the difference values between NADH production (2 × rgly + rNADH) and utilization (2 × rEtOH + 2 × rBy-CoA + 2 × rBtOH) were calculated. The result indicated that the values were almost in the range from 5 to −5, accounting for less than 5% of NADH production (or utilization), which confirmed the reliability of metabolic flux analysis. All of the metabolic flux analysis result supports the feature of high butanol/acetone ratio when adopting cassava substrate. Metabolic flux analysis of Clostridium acetobutylicum ATCC824 when using corn- and cassava-based substrates. Corn-based substrates (open symbols and broken lines); cassava-based substrates (filled symbols and solid lines). The real-time fluorescence quantitative PCR was also conducted to further interpret the mechanism of high butanol/acetone ratio in cassava-based fermentation. According to butanol synthesis map shown in Figure 1, acetate kinase and butyrate kinase responsible for acetate and butyrate synthesis respectively are encoded by the genes of ask and buk; CoA-transferase encoded by ctfAB is in charge of acid reutilization coupling with acetone formation; butyraldehyde dehydrogenase and butanol dehydrogenase encoded by adhE and bdhB are the key enzymes in the final two steps of butanol production. The results of gene transcriptional analysis are depicted in Figure 4. Variation in the transcriptional level of ask during the solventogenic phase was limited regardless of the substrate types. However, the transcriptional level of buk decreased significantly in fermentation using cassava-based substrate, while staying rather high in corn-based fermentation. Transcriptional level of ctfAB reached the maximal level at 79 h when using corn-based substrate, which was approximately sevenfold higher than that in cassava-based fermentation. Likewise, the maximal values of adhE and bdhB appeared at 79 h when fermenting on corn, which were respectively eightfold and twofold higher than those on cassava. Changes in transcriptional levels of key genes in corn- and cassava-based fermentations. Corn-based fermentation (white and parallel shadow bars); cassava-based fermentation (black and slashed shadow bars). (a) Transcriptional levels of ask (black and white) and buk (shadow). (b) Transcriptional level of ctfAB. (c) Transcriptional levels of adhE (black and white) and bdhB (shadow). Neutral red, an electron carrier, could force electron flow direction change. Adding a tiny amount of neutral red could weaken hydrogen formation which originated from the electron shuttle transport system, leading to an enhancement in NADH production. In order to further increase the butanol/acetone ratio, neutral red (0.1% w/v-broth) was added into cassava broth at 60 h, when butanol production was in a relatively high rate. As expected, rNADH was visibly elevated and then sustained at higher levels after neutral red addition (Figure 5d). Moreover, an increment of butyraldehyde concentration was observed, which suggests that butanol synthesis pathway was enhanced. In fact, butanol production was truly increased and reached 43 g/L (Figure 5c). However, butanol/acetone ratio was not improved by adding neutral red. Metabolic flux analysis indicated that the rates of organic acid formation and re-assimilation were promoted after neutral red addition, although the concentrations of acids in broth had not an apparent change. Acetone production was consequently promoted. Therefore, simultaneous increase in both butanol and acetone production led to an unchanged butanol/acetone ratio in this case. Table 2 summarizes the fermentation performance under different runs. Fermentation performances and metabolic flux analysis of Clostridium acetobutylicum ATCC824 when using cassava-based substrate. The substrate is either with (filled symbols and solid lines) or without neutral red addition (open symbols and broken lines). (a) Acetate (square) and butyrate concentrations (circle). (b) Glucose (square) and total acetone concentrations (circle). (c) Butyraldehyde concentration in broth (square) and total butanol concentration (circle). (d) Metabolic fluxes in cell supplemented with or without neutral red. Figure 6 compares the transcriptional levels of genes encoding the key enzymes in butanol synthesis with/without neutral red supplement. After neutral red addition, the transcriptional levels of ctfAB and adhE, responsible for acetone and butanol synthesis respectively, were apparently enhanced. This result was basically in accordance with the metabolic flux analysis results mentioned above. Changes in transcriptional levels of key genes in fermentations using cassava-based substrate. The substrate is either with (black and slashed shadow bars) or without neutral red addition (white and parallel shadow bars). (a) Transcriptional levels of ask (black and white) and buk (shadow). (b) Transcriptional level of ctfAB. (c) Transcriptional levels of adhE (black and white) and bdhB (shadow). The butanol/acetone ratio reached a much higher level of 2.87 in extractive fermentation with cassava substrate, a 64% increment as compared to using corn substrate (Table 2). It was close to the reported ratio obtained in fermentations by a hyper-butanol strain of C. acetobutylicum EA 2018 with corn-based medium . The preliminary analysis to fermentation performances showed that ORP and H2/CO2 ratio were both at low levels when using cassava (Figure 2). ORP could be considered as a comprehensive index reflecting pH, dissolved oxygen, reductive potential of compounds dissolved in medium . The ABE fermentation required an anaerobic environment so that dissolved oxygen in broth could be ignored. Change patterns of pH were basically similar when using different substrates. Thus, the lower ORP suggested that cassava-based medium was rich in reductive substances. On the other hand, H2 and CO2 are the two major components in the exhaust gas emitted by clostridia. H2 is generated from the electron transport shuttle system via the reaction of 2H+ + 2e− → H2 catalyzed by hydrogenase . CO2 is mainly produced in reaction of Pyruvate → Acetyl-CoA associated with formation of reductive ferredoxin, the electron donor for hydrogen or NADH generation . Therefore, lower H2/CO2 ratio implied that more electron flows were distributed to NADH production in the electron transport shuttle system. Based on the preliminary analysis results, metabolic flux and gene transcriptional analysis were conducted to verify the assumption and to elucidate the mechanism about high butanol/acetone ratio in cassava-based fermentation. The metabolic flux analysis revealed that NADH was truly generated more under the cassava-based environment (Figure 3), which was consistent with the preliminary analysis results. It should be addressed that the genes (adhE and bdhB) regulating butanol synthesis had higher transcriptional levels under corn-based environment, but more butanol production was obtained in cassava-based fermentation. This fact demonstrated that NADH generation rate is one of dominated factors controlling butanol/acetone ratio in ABE fermentations by C. acetobutylicum. Besides, metabolic flux of butyrate closed-loop (rByH and rACE-By) in cassava-based fermentation was largely weakened after shifting into solventogenic phase. Correspondently, transcriptional levels of buk and ctfAB (responsible for butyrate formation and re-assimilation respectively) were much lower than those in corn-based fermentation. In metabolic pathway of C. acetobutylicum, butyrate formation and re-assimilation reaction constitute a closed-loop (butyrate loop) at butyryl-CoA node (Figure 1). The butyrate loop not only competes with butanol synthesis route for carbon resource, but also relates to acetone formation. Therefore, high butanol/acetone ratio in cassava-based fermentation was also attributed to weakened metabolic strength of butyrate closed-loop. It could be concluded that higher NADH generation rate and lower metabolic flux in butyrate closed-loop worked jointly, leading to the high butanol/acetone ratio feature in fermentation with cassava-based substrate. The alteration of redox balance to promote NADH generation has been reported in many studies using corn or glucose as substrate. The methods of provision of artificial electron carriers such as neutral red , and methyl viologen -, ORP regulation , and inhibition of hydrogenase by spraying carbon monoxide ,, all of them have effect on enhancing butanol/acetone ratio. Among these approaches, adding neutral red seems to be the most appropriate one of low-cost and easy to operate. In the previous works, it has been demonstrated that adding neutral red could acquire a 63% increment in butanol/acetone ratio with corn-based substrate ,. Therefore, neutral red was added into cassava broth at 60 h when butanol production rate was in a relatively high level, in order to further enhance butanol/acetone ratio. The results indicated that final butanol concentration could slightly increase, due to the enhancements in rNADH and adhE transcriptional level after neutral red addition. However, the metabolic fluxes of organic acid formation/re-assimilation pathway and ctfAB transcription level were also enhanced after supplementing neutral red (Figures 5 and 6), which was actually beneficial for acetone formation. The simultaneous enhancement of both butanol and acetone synthesis route led to an unchanged butanol/acetone ratio in cassava-based fermentation with neutral red addition. It was speculated that under the reductive compound-enriched environment using cassava-based substrate, reductive power NADH might have been excessively produced/consumed leading to a burden on cellular metabolism . To match up relatively low fluxes of the acid loops with enhanced NADH regeneration in an appropriate way will be the key issue in obtaining further high butanol/acetone ratio while maintaining comparably high butanol productivity. In addition to strength of the reductive power, many other approaches have been adopted to acquire high butanol/acetone ratio. Among these efforts, some modifications to metabolic pathways were obtained good effect on increasing butanol/acetone ratio. Harris et al. used metabolic engineering tools to restrain buk (encoding butyrate kinase) expression and resulted in a significant increase in butanol/acetone ratio (3.8) . Jang et al. further strengthened the butanol synthesis pathway by up-regulating adhE expression, on the basis of the weakened acid formation pathway, which achieved a rather high butanol/acetone ratio (8.8) . However, some other attempts to regulate pathways had totally different results. Lehmann et al. sought to construct a pta/ptb double knockout strain of C. acetobutylicum but failed to find any positive clones . Tummala attempted to downregulate the expression of ctfAB, but observed high organic acid accumulation in broth with low solvent production . It could be found that all these efforts to extend the butanol/acetone ratio were involved in the modifications of acid formation pathways. It is known that acetate and butyrate formation pathways are the major energy substance (ATP) production route in C. acetobutylicum. As obligate anaerobes, clostridia are rather inefficient in energy production. So an irreversible change on the major energy substance (ATP) production route would inevitably bring adverse impact on cell growth and solvent production. In this study, a 64% increment in butanol/acetone ratio was obtained by changing corn to a cheaper feedstock cassava, without irreversible damages to cell or cost increase (the additional amount of yeast extract was rather less, and the cost of cassava-added yeast extract was even much lower than that of corn). Moreover, most of the mechanism analysis researches in the past were based on concise culture environment by using a defined medium. Therefore, this mechanism research based on biomass substrate was necessary for achieving high butanol/acetone ratio under industrial ABE fermentation condition. In addition, it was noteworthy that why higher NADH generation rate and lower metabolic flux of butyrate closed-loop appeared in cassava-based culture environment not corn? What special chemical compositions of cassava resulted in these phenomena? Aiming to illustrate the above questions, another research is now carried out by us. Currently, it is discovered that when carbon/nitrogen ratio (C/N ratio) in the substrate is increased from 46.7 to 186.7 mol/mol, acid formation is visibly restrained in the solventogenic phase, leading to a 28% reduction in acetone production, but no adverse impact on butanol production. Moreover, H2 generation dropped off rapidly, associated with C/N ratio increase, which implied that high C/N ratio could limit the electron directing to H2 synthesis and contribute to enhance NADH production. These results indicated that higher C/N ratio contained in cassava (118.8 mol/mol) compared to corn (21.9 mol/mol) may be one of the factors leading to higher butanol/acetone ratio. Besides, there are still other potential factors needed to be further confirmed. The toxic compounds contained in cassava, which may have caused the restraint of some enzyme activities such as CoA-transfer or butyrate kinase, is a notable aspect and needs to be explored deeply. A higher butanol/acetone ratio of approximately 2.9:1 was observed in extractive fermentation on cassava-based substrate, which had a 64% increment compared to that on corn-based substrate. The results from metabolic flux and transcriptional analysis indicated that the weakened metabolic fluxes in organic acids (especially butyrate) formation/re-assimilation pathways, as well as the enhancement of NADH generation, contributed to this higher butanol/acetone ratio feature in fermentation on cassava. Moreover, neutral red added in cassava broth could not further increase butanol/acetone ratio, which demonstrated that a further higher butanol/acetone ratio could be realized only when NADH regeneration is enhanced and the metabolic fluxes in organic acid formation/reutilization routes are controlled at suitably low levels simultaneously. E1, pyruvate-ferredoxin oxidoreductase; E2, ferredoxin-NAD reductase; E3, hydrogenase; E4, phosphotransacetylase; E5, acetate kinase (encoded by ask); E6, acetaldehyde dehydrogenase; E7, ethanol dehydrogenase; E8. thiolase; E9, CoA-transferase (encoded by ctfAB); E10, acetoacetate decarboxylase; E11, β-hydroxybutyryl-CoA dehydrogenase; E12, crotonase; E13, butyryl-CoA dehydrogenase; E14, phosphotrans butyrylase; E15, butyrate kinase (encoded by buk); E16, butyraldehyde dehydrogenase (encoded by adhE); E17, butanol dehydrogenase (encoded by bdhB). The study was supported by the National Natural Science Foundation Program (#20976072) and Major State Basic Research Development Program (#2007CB714303) of China. The authors also appreciated the assistance from Mr. Kevin Ding in refining the English of the manuscript. XL carried out the fermentation experiment, performed the statistical analysis, and drafted the manuscript. Z-GL carried out the fermentation experiment. Z-PS conceived of the study and participated in its design and coordination and helped to draft the manuscript. All authors read and approved the final manuscript.